What is a Network Diagram? What Is the Best Way to Layout a Network Topology Diagrammer? How To Create a Network Diagram? What is the best tool to create a network diagram? A Network Diagram Tool is used to lay out the architecture of a network in a visually appealing way. It displays the structure of a network by using a range of different line connections and symbols. This visual representation of a network makes it the ideal way to display and share how a network is set-up and laid out; it helps people understand how the various items within a network are interconnected. Creating a network diagram can be as straightforward as a singular application or as complex as a whole enterprise. Network design tools are used to represent a range of different networks, including, LAN Networks, Wireless Networks, Home Networks, Activity Networks, and more. There are two different types of network diagrams; the logical and the physical. Logical Network Diagrams demonstrate how the various network devices communicate and show the flow of data through a particular network. Routing protocols, network devices, and subnets are included in this type of network diagram. 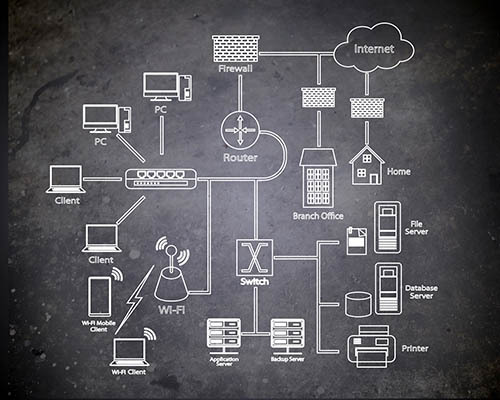 Physical Network Diagrams work in a similar way to a floor plan and demonstrate the physical layout of all devices that form part of the network. Why is a Network Diagram Important? If you need to troubleshoot problems on a network or you need to design a new system, a network diagram helps you to resolve matters more effectively. It gives you the ability to analyze and observe how the devices and different elements within the network are linked to one another. When you draw a network diagram online, there are many uses it can have. There are a number of standard arrangements that the majority of online network diagrams will follow. These specific network arrangements are also known as topologies and are used to outline both logical and physical elements with a Network. There are pros and cons to each different type of network topology. Knowing which is best will depend on your particular circumstances and requirements. Getting the right topology will impact the stability and overall performance of your network. With this type of topology, there are many individual nodes which are connected in the shape of a ring. Data is transmitted through each node in the circle until it reaches the desired destination. A major drawback to this set-up is that if one of the nodes fails, the entire network will fail. Despite the fact that all of the devices and connections have to share bandwidth, they are renowned for outperforming the bus topology networks. It is also very quick and easy to add and remove device and configuration is simple and straightforward. There are a number of different names that are typically given to this type of topology. It is one of the most basic network diagram tool outputs. Specifically, these are a linear, backbone or ethernet topology. Essentially, the different nodes are linked to a centralized ‘bus’ with two endpoints. This type of online network diagram is simple to configure and uses fewer cable than any of the other types of topologies. The only drawback being, if the central ‘bus’ stops working, the entire network will fail; and this can be challenging when trying to problem solve and troubleshoot the issue. There are a couple of varieties of mesh topologies used in online network diagramming; there are full mesh and partial mesh. With the full mesh topology, every node is directly linked to each other node. With a partial mesh topology, nodes are only linked to those which they interact with the most. When you consider drawing a network diagram, the star topology is probably the most common of all arrangements. Each of the nodes is all linked to a centralized switch or hub, in which all data is passed through. A star topology is known to be more dependable than either a ring or bus arrangement due to the fact that individual nodes can fail without impacting upon the wider network. Additionally, if an individual node needs to be taken down for maintenance or repair, it is far easier to do. However, if there is a failure with the centralized switch or hub, this will cause the whole network to stall; and star topologies tend to carry higher cabling costs than most other network arrangements. This type of network diagram arrangement is a combination or the star and bus topologies. The majority of networks will entail a combination of network arrangements in order to create a hybrid network solution. A quick search on Google will reveal a whole host of networking design tools and free network diagram software options. However, before you start creating your online network diagram, it is important to have a clear set of goals in place. You will need to consider what specific elements need to be incorporated in order to help you achieve any pre-defined goals before you start drawing the network diagram. Always consider that it is far better to draw multiple network diagrams in order to depict comprehensive ideas, as opposed to trying to cram in too much data into a smaller space. In the next section, we will explore some of the best networking diagram tools, but for now, here is a basic overview of the steps to take for drawing a network diagram online. Choose a template from within your network design software or start with a blank canvas. Then, input all of your equipment on the networking diagram tool. 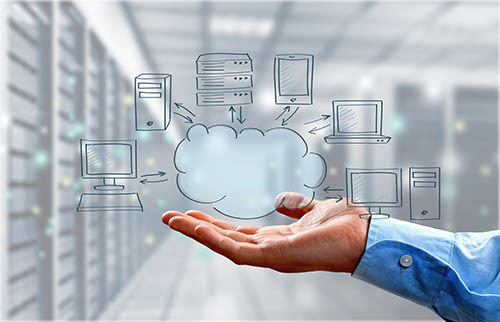 At this point, you don’t need to worry too much about any of the connections, just try to ensure that every firewall, device, router, server, and any other elements that form part of the network is included and added to the network designing software. Now, it is time to arrange the shapes and start forming the online network diagram. Review your original goal that was laid out at when you started the network topology diagrammer process and consider the specific network topology that you will be using. The next stage in drawing your network diagram is to label each of the individual elements. At this point, you might need to know data: for instance, the type of device and the IP address. Depending on which free network diagram software you choose, you might have the option to add each component and its accompanying details in a separate legend. At this point, you will then need to start adding in the connections to your online diagram tool. This will outline the relations between the nodes, along with helping to understand the flow of the data. The final step in the process of drawing your network diagram is to tidy up any formatting, such as sizing, placement, and colors. You are then ready to save you online network diagram. If you are looking for the best network design software, then you’ll be pleased to know there are plenty of options available to choose from. Free networking diagram software is available in abundance. However, for such an important task, you would also need to consider the best networking design tool to meet with your needs today, and in the future. They offer solutions to suit all levels and complexities. If you are drawing a network diagram for the first time; they offer a simplistic approach, and they have lots of tutorials on their website about how to get started with drawing a network diagram. They also offer a free trial of their network diagram drawing tool. This is another top-rated network diagram software tool that is packed with a ton of features. The interface is very similar to that of MS Word which makes it very easy to use and get started drawing your first network diagram quickly. It costs around $200 for the full version but offers an abundance of business diagramming capabilities. They also offer a lite-version that is a free network diagram drawing tool as well. InterMapper is an intelligent online network diagram tool that not only does network mapping, but it also features a monitoring software element for Windows, Mac, and Linux which delivers a real-time view of network performance and configs. It is more complex than some of the other network diagram design software choices. However, it offers a free version that monitors up to ten devices and is licensed on a per-device basis. Previously known as LANSurveyor, this is probably one of the best network designing software tools on the market at present. It will automatically create a network map from a scan and provides a host of useful features. It makes drawing a network diagram effortless and produces an extensive range of reports for subnet scanning, VLANs, switch ports, and more. With automated device detection, and exportable diagram capabilities, it offers a comprehensive solution for drawing network diagrams quickly and effectively. CADE can be used as a desktop version or via a browser. It is one of the best free network diagram drawing tools which allows multiple users to be able to work on a single network diagram at the same time. You can easily export your network diagram drawing into PDF, JPEG, XAML, and EMF. This network diagram software is very similar in its look and feel to the earlier mentioned ConceptDraw Pro. It is simplistic yet functional, and very easy to use. For those who want to draw a network diagram for the first time, the layout is akin to MS Word, which makes it very quick to pick up and easy to navigate. It is vector-based, allowing users to be able to zoom in without any distortion and also print with a high-level of clarity. It is an all-in-one business diagramming tool meaning it provides additional functionality to the business. This is another simplistic network diagram software tool that has thousands of symbols and icons to choose from. The interface is easy to use and great for those looking to create a network diagram for the first time. Network diagrams can also be exported into BMP, EMF, GIF, PNG, JPEG, MNG, PCX, and ICO formats. The best network diagramming tool will depend on your individual needs, your budget, and your level of experience using network diagram design tools. There is plenty of choose from, many of which are free or come with free trial or lite-versions.